City University London is delighted to introduce you to City alumnus Peter E Roe (BSc Computer Science 1971) author of the series Pigs Might Fly. The series compiles the fascinating stories of the lives of those early dreamers the pioneers of aviation. 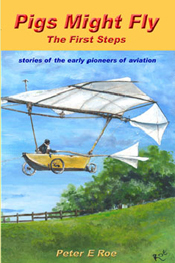 This series it’s probably the most complete anthology of early aviation pioneers ever published. This event will be a great opportunity to meet Peter and hear about his incredible journey of discovery about many of the almost forgotten 'stars' of aviation, half of whom have never been written about before. Peter will concentrate his talk on those pioneers who had a connection with City. Alumni, students and members of the public are very welcome. Born in Norfolk, England he spent his career in computer systems development, IT management and business process improvement.His interest in the pioneers of aviation has developed over many decades. Apart from a few biographies and short pen portraits, there has been a lack of information about so many of these amazing people. Since nothing else existed, he ambitiously decided to write a book (which grew into six volumes) that he wanted on his own bookshelf.Its completion took a lot longer than anticipated but he was delighted to have completed it and to be able to share it with others interested in the development of aviation from a human rather than technological perspective. He and his Canadian-born wife Linda live in Lunenburg, Nova Scotia, Canada.Linda is the artist who has painted the covers for all six books.